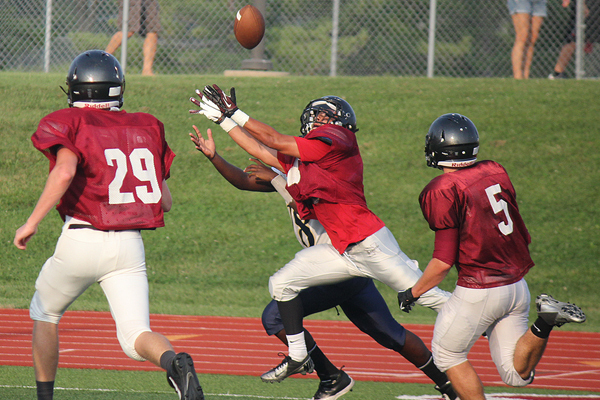 The William Chrisman football team’s first three snaps in Friday night’s jamboree at Lee’s Summit North left little doubt that the Bears have plenty of work left to do before opening the season next week against Platte County. Chrisman started the night against the Broncos by losing a fumble on a botched snap, committing a penalty and turning it over a second time on another poor snap exchange. Things were rough for most of the night as the Bears also faced Maryville and Center. They reached the end zone just once on a 13-yard run by De’Vante Wilkerson and surrendered seven touchdowns. As shaky as the Bears played, Crutcher cautioned that there’s still no reason to panic. Early-season rust is always to be expected, but especially in Chrisman’s case as the squad is transitioning to a flexbone hybrid offense after running the spread last year. The Bears are also working in a plethora of newcomers into their offensive line and still seeking to develop some chemistry in that unit. And as Wilkerson pointed out, much better to sort this stuff out now rather than next Friday.